Billet upper receiver precision-machined from 7075-T651 aluminum with true black type III class 2 hard coat anodized finish. 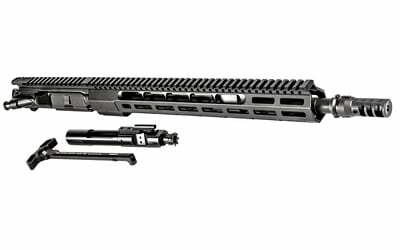 Wedge Lock handguard with continuous top rail and M-LOK mounting system. Includes Slide Lock charging handle and bolt carrier group. Match grade 4150 chrome-moly barrel with QPQ corrosion resistant finish; muzzle brake. Designed and manufactured in the USA.